A Missouri candy maker is giving broken chocolate bunnies a second chance at finding a good home. You’ve heard of the Island of Misfit toys from the classic "Rudolph the Red-Nosed Reindeer" Christmas TV special but did you know there’s also a special place for misfit chocolate Easter bunnies? Meet "Andy Candy," aka Andy Karandzieff, the owner of the 100-year-old Crown Candy Kitchen in St. Louis. Karandzieff hand-pours around 9,000 chocolate Easter bunnies each season ... but, inevitably, some of them break in the process — usually at the weaker points like the head, paws or ears. While the candy maker could re-melt the chocolate to make something new from these leftover chocolate odds-and-ends rather than throwing them out, food waste is a growing problem in America. So instead, Karandzieff turns his leftovers into what some might call freakishly delicious works of art. It all started when he ran out chocolate bunnies about eight years ago. Andy Candy then decided to sell the broken pieces, largely heads and bodies, that were sitting around. “I thought maybe I could do something a little more creative with these, so I started gluing different heads on different bodies,” Karandzieff told TODAY Food. To his surprise, the store quickly sold out of the misshapen chocolates, and an Easter tradition — albeit an unusual one — was born. Now, Karandzieff takes his “misfits” and concocts all manner of imaginative creations. This year, customers can expect a Mr. and Mrs. Bunny, but the Mrs. now has a bear’s head. There's also a giant rabbit with a doll head (the biggest he’s ever made), and a rabbit with two heads — one on its body and one in a basket. Nothing creepy about that! All of Crown Candy Kitchen’s chocolates are priced by the pound, so the misfits cost between $6 to as much as $30 for the really big pieces. But, Karandzieff said he’s not going to put them out for sale until they start to run low on traditional chocolate bunnies, which usually happens the week before Easter. You’ll have to be there at the right time if you want to score one of his creepy candies. “It’s going to be the luck of the draw,” he said. But even if you miss out on a misfit, you might still be able to score one of his traditional Easter monkeys, a popular, but quirky item they ship all over the country. Karandzieff said making the misfit candies adds a little fun into what can be a very busy season. “Nothing says 'happy Easter' like a creepy doll head in your kids’ Easter basket!” he said. Do you wind up with a lot of leftover chocolate and candy after Easter? 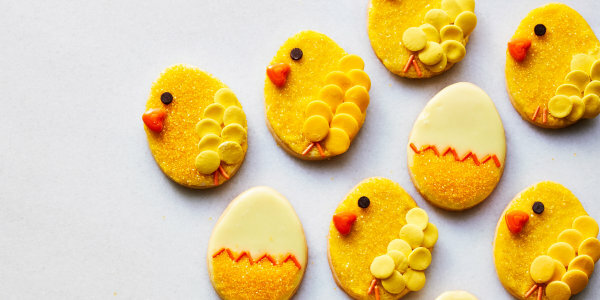 Here’s a great way to use up Peeps and check out even more fun recipes for extra Easter candy.